Close Distance is a short film created by Stefano Nurra & Florian Schwarz. It compares the lives of citizen scientist Caroyln Bol, who has taken part in Planet Hunters, and Dr Martin Dominik at the University of St Andrews, who uses technique called gravitational microlensing to detect exoplanets. It’s a really nice look at what amateur and professional planet hunters have in common, which more than anything may be enthusiasm and a hopeful outlook on planet hunting. A lovely 10-minute documentary that you can find here on YouTube. We recently posted news of a Planet Hunters planet discovered as part of a seven-planet system. Dubbed Kepler-90 this system is a peculiar microcosm of our own Solar System, with small (probably rocky) worlds in the middle, and larger (probably gaseous) worlds on the outside. 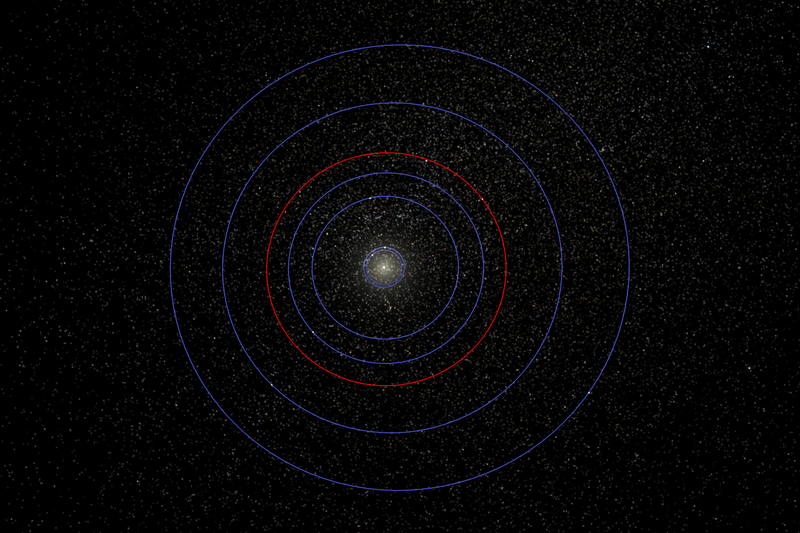 The major different being that the outermost planet in this system is as far from the star as Earth is from the Sun. The other six planets in this system were already known about, but thanks to volunteers on Planet Hunters (http://planethunters.org) we now think that there are seven worlds circling this stars, which is just a little brighter than our Sun. 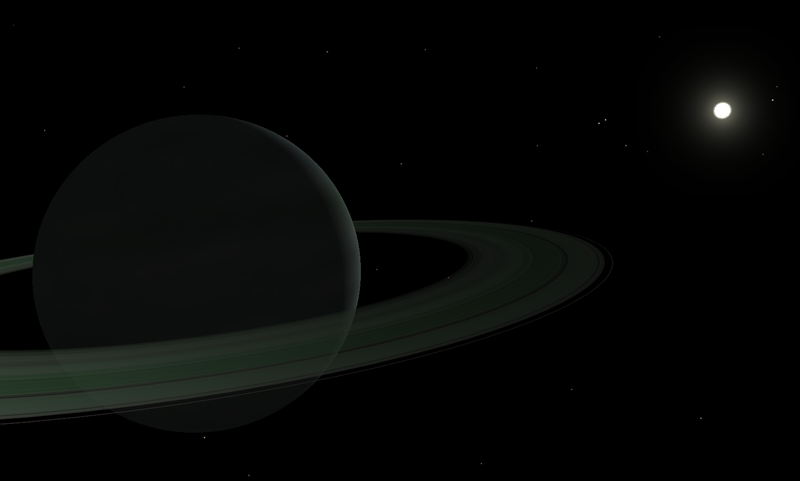 To celebrate this fact I have created a model of the whole planetary system in Celestia, an awesome, cross-platform, open-source package that lets you explore space. You can download the Celestia files model directly here or watch the video below to be taken on a tour of Kepler-90 and it’s seven worlds. In this video, I’ve given the newly discovered Planet Hunters candidate some fetching green rings – which we do not have any evidence for or against. Also keep in mind that we know very little about what most exoplanets look like, so we’ve used artistic license to give them all different appearances, often using the surface of what might be analogue worlds in our Solar System. Maybe you can spot some familiar surfaces amongst them! This system has some great features that make it interesting. The outermost world is roughly the the size of Jupiter but orbits at almost exactly the Earth-Sun distance of 1AU. A Jupiter-like world in an Earth-like orbit has been seen before in Planet Hunters discoveries. The middle planet in this system is at the same distance from this star as Mercury is from our Sun, but is six times as large. 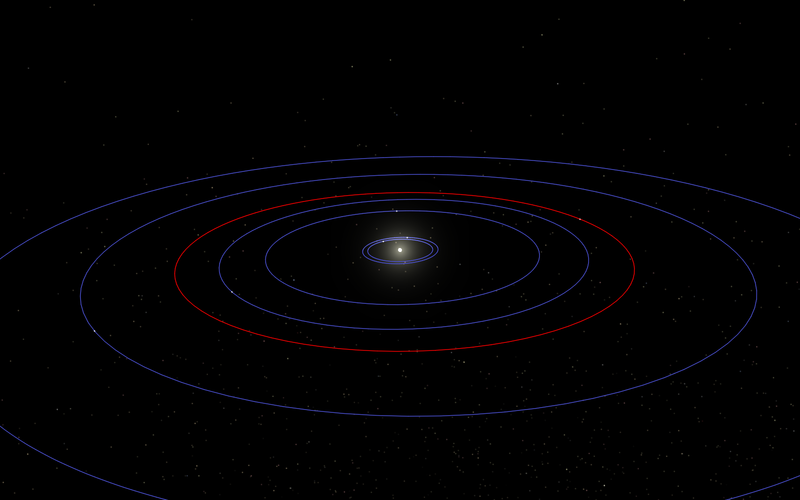 The rest of the planets whizz around in even smaller orbits. This star is a little hotter than our Sun so they are pretty scorching places with surfaces temperatures in the hundreds of degrees – nearly a thousand for the innermost planets. The two innermost planets are roughly Earth sized and are really cool. The innermost one is 1.02x the diameter of Earth and the next is 1.18x. We assume that they are both rocky since they are so small. They orbit the star in just 7 days and 9 days respectively and are very close together. So close in fact that if you’re living on the inner, smaller planet then every few weeks, for about a week, the second planet appears in the sky about half the size of our full Moon. Every year I see the rumour going round that Mars is going to be as big as the full moon. It will never happen for us – but on the tiny worlds circling Kepler-90, it happens all the time. Update: The system used to be called KOI-351 but was given the name Kepler-90 just a day after this post went live. I have updated the name of the system in the text.